Kawau Island, in the Hauraki Gulf to the North East of Auckland is only accessible by boat with ferries and water taxis going across from Sandspit. Kawau doesn’t have any roads or cars making it very peaceful but also problematic to get around if you don’t have your own water based transport. One option is to choose a cruise like the Royal Mail Run which will take you all round with commentary about the history of the island. Once over there, Mansion House is worth stopping at. It’s a big old colonial house built for the superintendent of the mining industry on the island in the 1800s. It was then purchased by the Governor General of the time, Sir George Grey in 1862 and the grounds were extensively developed. Sir George favoured exotic species which is why there are still wallaby hiding out in the area behind the café. They’re very shy so it’s highly unlikely that you’ll spot one but there’s no harm in getting your kids to look! 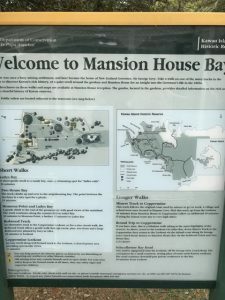 You can visit the mansion for a small fee but it is very museum like (lots to read and look at but not interactive) so might not interest all kids. The grounds are extensive with gravel paths and lots of walking options from 15mins to over 2 hours, taking in lookout points and other nearby bays while also giving an insight into the old mining industry. There’s a café for buying meals, snacks and drinks but if you have a picnic with you, the grassy area near the house is a good place to throw out a blanket. Across the bay, accessible only by boat is the Kawau Boating Club (closes over winter June – Sept) which serves as the local pub and mini-shop. You can get meals, drinks and some basic provisions. Round the corner from here is a small playground – a couple of swings, fireman’s pole, slide and monster monkey bars (you’ll need to watch smaller kids on these as they’re very high up). There are also picnic tables and grassy area for enjoying your own food if you’ve come prepared. Mansion House is open Monday – Friday 12pm – 2pm, Saturday, Sunday and Public Holidays 12pm – 3.30pm. Cost for going in the house: Adults $4, Kids (5-15years) $2 and under 5s FREE. Note: Mansion house is closed after Queens Birthday Weekend in June until the beginning of September. Visiting the gardens, doing the walks or having picnics on the grass is available at anytime. The Bon Accord Bar & Bistro at the Kawau Boating Club open daily during the summer but closed Tuesday and Wednesday from after Waitangi weekend to Anzac day. Opening hours from 10.30am Monday, Thursday & Friday and from 9am Saturday and Sunday. Kawau Cruises 09 425 8006 from Sandspit Wharf 0800, 1030, 1430, 1600 and 1830. Hauraki Express 027 664 6644 from Sandspit, Omaha or Warkworth. They will also operate late with return trips from Kawau to home and even Auckland to Kawau return! Piers Barney 027 218 4595 personalised departures ideal for large groups and fishing trip.